Storytelling is probably the oldest & most popular art in the world. Movies, literature, paintings, songs, tweets, memes, status updates- all have storytelling as their central focus. A good story has a potential to captivate audiences on any & all mediums. We’ve evolved drastically when it comes to techniques & mediums as a result of technology, but the same stories still captivate our hearts & mind. That’s why themes such as- boys becoming men, good vs. bad, boy meets girl, the struggle of the underdog – are all themes which were relevant & popular in the formative years of storytelling & will continue to be, long after these 2D screens are replaced by some crazy holographic displays. Similarly, all brands have a brand story which if harnessed effectively will make it more recognizable. Due to constantly evolving mediums, you need to make sure that your brand storytelling is not just limited to traditional media like newspapers, OOH & TV. 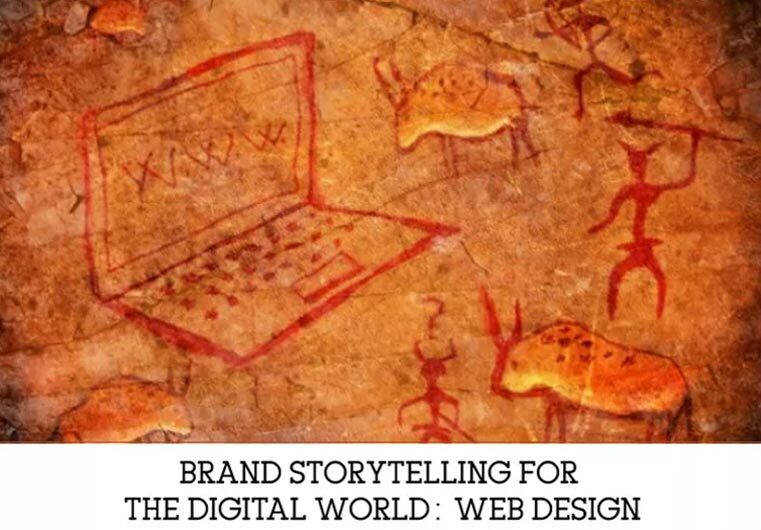 It is important for brand owners to create brand stories for the people who matter the most to them- their customers & share them where they spend the most of their time- the digital world. The 2 crucial components remain the same- what is the story being told? How is it being told? In this multi-part mini-series, we explore brand storytelling and its different facets in the digital era. In the age of the cloud, this is one of the key chapters of your brand story. It is akin to a shop’s entrance in the physical world. And you’d definitely want to provide the best brand experience to everyone who arrives there. The look & feel of your site, the content & its tone of voice, the story behind your brand’s existence- are all just as important as the product or service being offered ultimately. 1. Be in synergy with the brand values. Just like a good actor never breaks out of character; a good website should never stray away from the brand’s overall personality. A branded, digital experience for job seekers seeking information about what it’s like to work for Nike and to find & apply for positions. 2. Be inviting so that every visitor feels tempted to explore more. The age of the internet is also the age of distraction. Your brand website must ensure- through it’s UI & content- that the visitors are intrigued & spend more time on the site. 3. Be responsive to maintain a similar feel on all devices. Your visitors can browse using a multitude of devices with different screen sizes & capabilities. A responsive web design ensures that the website adapts itself according to the device. 4. Be intuitive so all the information is easy to locate. Usually, if a visitor isn’t able to easily locate the information he’s looking for he’s bound to visit one of your competitor’s website. 5. Be in sync with the brand’s overall communication to avoid plotholes. Simply speaking, all your brand collaterals- physical stores, advertisements, kiosks etc. should be different chapters of one big story. Use small elements so that the consumer becomes a part of the journey as opposed to a mere spectator. The website for National Geographic Channel’s Eat: The Story of Food is a brilliant example of the web design adage: ‘Always let the story lead, & let the tech be a means to help tell it’. 7. Tell visitors what you do at a glance. A new visitor should know what business you’re in the first few seconds on the page. It’s often not necessary to display it as text; but can also be done through a customized mouse pointer, the loading page or even the ‘buffering’ icon. Loading page for Alfred Service which gives you a prologue of the story to follow. 8. Not have a lot of knick-knacks. Resist the urge to stuff every widget and plug-in you can find. Clean and to the point always works better. To sum up, before you start designing/ redesigning your brand’s website it’s always beneficial to spend some time and carefully plan the overall brand experience you want to provide the visitors. P.S. If you’re thinking of building your brand website, get in touch to plan the perfect narrative your brand needs & deserves.